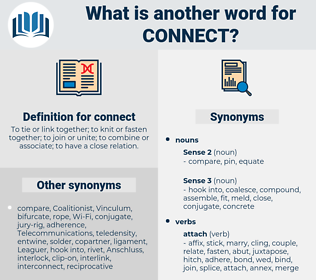 What is another word for connect? To tie or link together; to knit or fasten together; to join or unite; to combine or associate; to have a close relation. was on a par with. relate, combine, interact, link, switch. lay, relate, correlate, ties, integrate, reconcile, interlink, interact, commit, federate, pair, link, switch, involve, incorporate, Linking, access. loosen, sever, disjoin, disunite, disconnect, imbalance, Unlink, dissociate, separate, detach, divorce, divide, disagree. disengage, isolate, distinguish, unhitch, disband, contrast, discriminate, disaffiliate, resolve, deny, unchain, part, scatter, rupture, differentiate, section, disperse, cleave, split, fractionate.
" And there isn't a boat to connect with the Pacific Mail for twenty - six days," said Trask. And how could Helen connect that delightful 'one' with Franklin, and with her own attitude towards Franklin? bridge over, attach, hang together, tee, ground, hitch, join, conjoin, interlink, daisy-chain, put through, interconnect, tie, interdepend, bridge. collide with, impinge on, HIT, strike, run into.